Government workers challenging the legality of the partial government shutdown will face Senior Judge Richard Leon during a Jan. 31 hearing in U.S. District Court for the District of Columbia. Government workers challenging the legality of the partial government shutdown who await a Jan. 31 hearing face a judge who has participated in investigations of three administrations, and who isn’t easy to pigeonhole. “What you’ll quickly discover is that Judge Leon will bring independent judgment to a matter without regard to the political impact of his rulings,” said David Laufman, a Washington-based attorney and former federal prosecutor who got to know Judge Richard Leon of the U.S. District Court for the District of Columbia in the early 1990s when they worked together on a congressional investigation. The Jan. 31 hearing will be on the status of the lawsuits now that the shutdown has ended. When it was initially scheduled, it was to consider the plaintiffs’ motions to stop the government from failing to pay agency employees who had been required to report to work during the shutdown. The government is asking Leon to dismiss the government shutdown lawsuits. Leon, who was appointed by President George W. Bush in 2002, usually grants motions to dismiss in cases involving government employees, employment law, and labor relations, according to Bloomberg Law Litigation Analytics data. He granted such motions about 82 percent of the time in government employee cases, about 72 percent of the time in employment law cases, and about 71 percent of the time in labor law cases, the data show. About 800,000 federal workers were directly affected by the partial government shutdown that ended Jan. 25, including about 420,000 who were working without pay and another 320,000 who weren’t reporting to work. One of Leon’s most high-profile rulings came in Klayman v. Obama, where he cast doubt on the legality of phone surveillance activities implemented by the National Security Agency. Leon issued a preliminary injunction barring the government from collecting—as part of a broader surveillance program—any “metadata” associated with phone calls made by plaintiffs Larry Klayman and Charles Strange. The ruling was hailed at the time by privacy rights advocates, including the American Civil Liberties Union and then-Senate Judiciary Committee Chairman Patrick Leahy (D-Vt.). In a separate case, Leon was criticized by economist and Washington Post contributor Steven Pearlstein for what Pearlstein described as faulty reasoning in his ruling allowing AT&T Inc. to acquire Time Warner Inc. Leon didn’t “share any convincing logic or evidence to conclude that a combined AT&T/Time Warner would never, ever want to use its control over Internet access to shut out or disadvantage content from rivals,” Pearlstein wrote in a June 2018 column on the judge’s ruling in U.S. v. AT&T. Leon was a partner in the Washington office of Baker & Hostetler from 1989 to 1999, and with Vorys, Sater, Seymour and Pease from 1999 to 2002, according to a profile on the D.C. district court’s website. Leon served as counsel in congressional investigations of three different administrations, according to the profile: Iran-Contra, Whitewater, and the “October surprise” task force. The task force in 1992 looked at whether the Reagan campaign sought during the 1980 presidential election to secretly negotiate with Iran as a way of preventing Iran from releasing the hostages during the campaign. A spokeswoman for the district court declined to comment. Leon “does not give interviews,” the spokeswoman told Bloomberg Law. The judge isn’t afraid to express himself, Laufman said. Leon “brings a vitality and passion and exuberance to his responsibilities as a judge that can clearly be seen in how he interacts with attorneys on both sides of an issue in court, and how he crafts his opinions,” Laufman said. In fact, in this shutdown case, Leon issued a strongly worded ruling in which he turned down employee and union requests for a temporary restraining order that would have required the government to immediately start paying essential employees who were required to work, or allow them to not work. “It would be profoundly irresponsible under these circumstances—with no record whatsoever telling me what government functions would be impacted—for me to grant that TRO. At best, it would create chaos and confusion—at worst, catastrophe!” Leon wrote in an order filed Jan. 18. 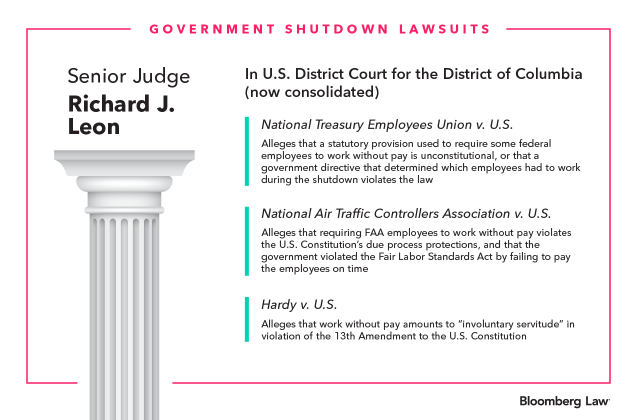 The lawsuits will continue even with the end of the shutdown, with the goal being to prevent future shutdowns, an attorney told Bloomberg Law. The attorney represents a group of plaintiffs who allege that threatening workers with discipline if they don’t work without pay amounts to “involuntary servitude” in violation of the 13th Amendment. Attorneys who appear before Leon “can expect to be on the receiving end of very targeted questions from the court to amplify why they believe the law and the facts” support their arguments, Laufman said. Leon “has a genial manner, but at the same time he’s very exacting,” he said.